The first 2.5 chapters of The Encore can be viewed using the “Look Inside” feature on the Amazon.com product page for the Kindle ebook version. Below is the remainder of Chapter 3, The Mission. More excerpts will be revolving through this webpage over time. 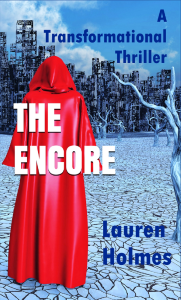 Register or Login to see two additional chapters of The Encore which reveal Lauren’s unprecedented high-growth, high-performance technology used in the ecothriller to save the planet. “Thank you, Rikard. I’d be delighted,” responded Connor perfunctorily. “Pardon my intrusion, Axl,” he said finally acknowledging the Minister’s presence with a nod in his direction. “I’ll leave you gentlemen to your important work.” With that, Rikard turned and abruptly exited the office with the same speed at which he had burst into it. Supreme Commander Riis has the charm, charisma and sociability of successful politicians. However, he has very little of the substance that Axl possesses. It was obvious to Connor that someone had bought this man’s way into his current position. Riis was a front. A puppet. And by the strain he sensed between the two men, Connor suspected that Axl was not the puppet master but the enemy. Riis also lacked Axl’s benevolence. In fact, there was a foreboding in his manner which made Connor fearful. He realized that he would be even more uneasy if Axl was no longer there to protect him. In an instant, he realized his dependence on the Minister. He accepted that Axl was friend not foe. Alone again, Connor restarted the discussion, “So have you brought me here to die, Axl? I fear our friendship is going to be short-lived,” he quipped. “I relate, Axl. I suspect I’m not the first,” he joked. Axl laughed again succumbing to the distraction. “Would you believe this is the oldest known relic from Earth? I’ve often wondered if it suggests the time when Annutia was terraformed. Laurel and Hardy were famous from the late 1920s to the 1940s. Annutians tend not to concentrate on history as much as they do on Earth because our religion has us focusing on the ‘now.’ We’re taught mindfulness and contemplative techniques and practices in school from the first grade to help us to do that. “Unfortunately, we’re a population devoid of creativity. We have so many rules, and so many castes and so much prejudice and judgement that we’ve all but eliminated the courage to be creative. We’ve become a left-brain society where logic reigns supreme. Our creative right brains have atrophied. “I’ve studied your career, Connor. You’ve worked on the liberation of individuals to their full creative expression for 30 years. When you assumed the role of Commander-in-Chief for Global Human Resources Maximization, you had your strategic plan completed and being actioned in your first month. You established most of the structures for global conversion in your first two months. What is it you call yourself? Oh yes. An execution creative. “This is your encore, Connor. Faster. Smarter. With higher stakes. And with more fulfillment than the first time around. There is no project more meaningful for you to undertake. “If you went back to your retirement on Earth without at least trying, you’d regret it for the rest of your life. Facing death is not the anathema for you, Commander Kane. Facing a life without meaning, purpose, and mission is far worse for someone of your talents and passions. “You’ll see, Connor. We’ve already started. We’ve released your speeches and writings into our corporations and upper educational streams to get people thinking about the conversion. Connor refrained from comment while he began to formulate possible strategies. He was indeed an execution creative by passion. He believed he could implement anything even if it had never been done before. He found new implementation challenges irresistible. Axl moved to the door and opened it. “So sorry to have kept you, Annalise. Please come in for a moment. Commander Kane needs library access to Earth information to find common ground for his speech to the Council tomorrow. He’s also going to need information about the Council Ministers, so he can shape his speech to his audience. “I think it’s also advisable that you make him aware of the conflicts among them so that he’s not blindsided. In fact, why don’t you bring him at the beginning of the Council meeting so that he can observe the conflicts and players in action. And without even a moment to consider or to ask a question, Connor suddenly found himself outside of the Minister’s inner office next to its closed door. Connor was impressed by how smooth Axl was. He felt out-finessed. “This way, Commander,” directed Annalise. The tall and muscled Brik again trailed them. Obviously, Axl considered him a VIP needing a bodyguard. As they stepped out of the elevator on his floor of the residential tower, Connor could see at the other end of the hall Jon sitting at the table guarding his suite. Perhaps Axl was right. Maybe he’d underestimated his talents somewhat despite the celebratory gala. As they arrived at the suite, Annalise walked to the office where an external telephone resided. Connor took the covers off his lunch while he pondered how he was going to tell Lenore that there was a good chance that he would be dead within the year.